"REMARKABLE SOLAR ACTIVITY: There haven't been any strong solar flares in days. Nevertheless, some impressive activity is underway on the sun. For one thing, an enormous wall of plasma is towering over the sun's southeastern horizon. Stephen Ramsden of Atlanta, Georgia, took this picture on Nov. 11th:"
"Remarkably, though, this is not the biggest thing--not by a long shot. A dark filament of magnetism is snaking more than halfway around the entire sun: SDO image. From end to end, it stretches more than a million km or about three times the distance between Earth and the Moon. If the filament becomes unstable, as solar filaments are prone to do, it could collapse and hit the stellar surface below, triggering a Hyder flare. No one can say if the eruption of such a sprawling structure would be Earth directed." "I can't help but wonder what could possibly come next since we are still over a year away from the forecasted Solar Maximum," adds Ramsden." Wow I have not heard about this huge solar activity...is this very recent? 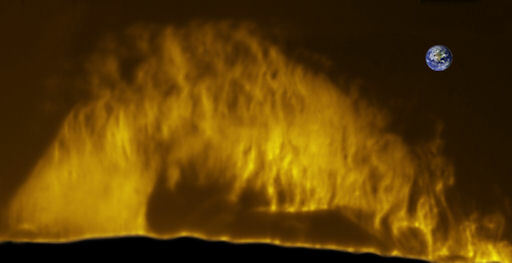 I admit, I do not keep up with solar activity as much as I want to because the typical NASA images of the sun scare me. I finally admitted it ha. I wanted to add Revelation 6:8-9 to your verses about solar activity. "The fourth angel poured out his bowl upon the sun, and it was given to it to scorch men with fire. Men were scorched with fierce heat; and they blasphemed the name of God who has the power over these plagues, and they did not repent so as to give Him glory."